The electronics courses are certified through the London City & Guilds of London Institute. Successful participants can achieve a certificate for each electronics course module and ultimately achieve a Diploma in IT Systems Support awarded by the London City & Guilds Institute outlined in the graphic at the end of this page. The electronics courses involve Analogue and Digital Electronics, Computer Maintenance, Networking and IT Customer Support. This foundation electronics course is designed for participants of all skills levels. Participants will gain experience of working with a wide range of electronic components and learn how to construct, test, fault find and use electronic test equipment. Read more about the Electronic Equipment Repair 1 Course here. This electronics course builds on the skills and knowledge gained in Electronics Equipment Repair 1. Participants will work with a wide range of complex analogue circuits, components and diagnose and fault find and learn to use more complex electronic test equipment. Read more about the Electronic Equipment Repair 2 Course here. This digital electronics course is designed to give participants a practical knowledge of the type of electronic circuity used in a Computer System or in any type of Computer Controlled equipment such as Photocopiers, Cash Registers, Tablet, Laptops, etc. Digital Electronics involves the use of Silicon chips (Integrated Circuits). The internal structure of a computer is to a large extent comprised of Digital Electronic Circuits Read more about the Digital Electronis Course here. This course equips participants with the skills to identify network concepts, terminology, install, configure, and test networks. Skills, concepts and theory are covered in this City and Guilds certified course. Read more about the Computer Networking Course here. This course enables participants to diagnose and repair system level faults in computer based systems, demonstrate practical and theoretical understanding of PC systems, and much more. Read more about the Computer Maintenance Repair Course here. This course will equip participants with the skills and knowledge to provide technical information and support, assist in reviews of procedures and carry out automated procedures. Read more about the IT Customer Support Course here. Successfully completing a combination of optional and required courses can lead to a City & Guilds Internationally recognised Diploma in IT Systems Support (7267-24). 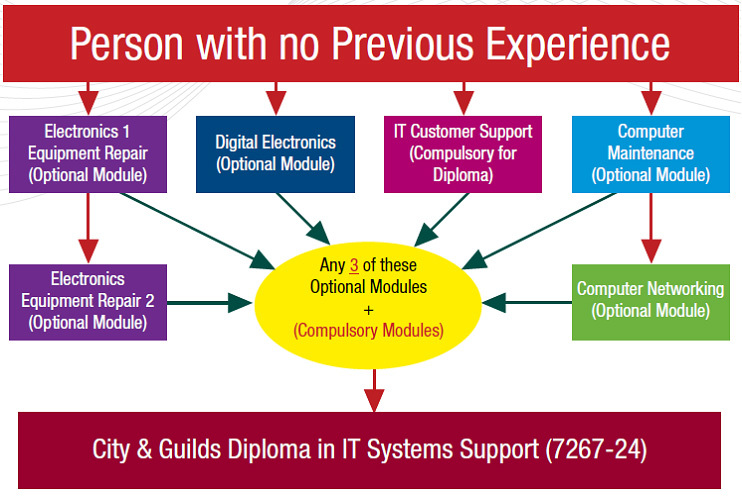 In order for participants to successfully achieve full certification for the IVQ (International Vocational Qualification) Diploma in IT Systems Support, learners must complete 4 units, comprising one core (shown in Red), plus three optional units from the choice shown in the table i.e. IT Customer Support Unit + 3 Optional Units = IVQ Diploma in IT Systems Support. Participants will achieve a City & Guilds Certificate for each successfully completed unit.